Just after Porsche director of GT cars Andreas Preuninger said that setting fast Nürburgring lap times wasn’t a priority, Porsche announced that they set a time with their new 2018 911 GT3 that’s 12.3 seconds quicker than the previous 911 GT3: a 7:12.7. There’s not a lot of consistency in what comes out of Preuninger’s mouth, and I don’t care. That lap time rules. As you can see, Porsche’s new “driver’s car” GT3 turned out to be really, really, respectably quick! 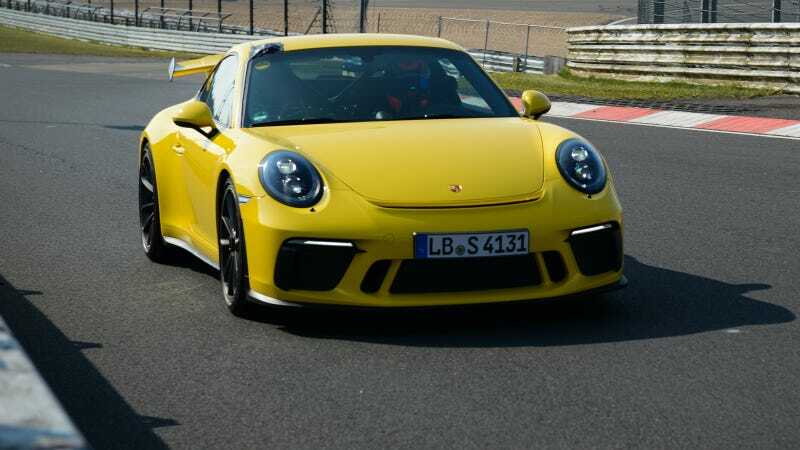 Porsche test driver Lars Kern set the new GT3's lap time with a PDK-equipped model with the optional carbon-ceramic brakes on Michelin Sport Cup 2 N1 tires. A clear, cool (46 degrees F) day provided the perfect conditions to go to plaid on a race track. A notary public was also on hand to witness the lap time. As Motor1 notes, a 7:12.7 makes it the second fastest Porsche to ever lap the Nürburgring after the Porsche 918 Spyder ultra-mega-hypercar, so naturally, Porsche is going to milk that for all it’s worth. While it’s not an outright “we’re the fastest” announcement—there are still faster sports cars from other manufacturers that weren’t mentioned in Porsche’s latest press push for the GT3's lap time—it’s a bit of a relief to hear that Porsche still cares about our favorite manufacturer dong-waving contest. We wouldn’t have it any other way. If there’s one thing that riles up German car fans, it’s all things Nürburgring, so Porsche knows exactly what they’re doing when they toy with our emotions here. It is the fantasy land we all want to flee to instead of Canada. “Will they or won’t they give us a lap time?” is a scandalous question to this crowd. It’s like asking if Tim Hortons is going to discontinue the Double Double. A few years ago, lap times like this could only ever be achieved by thoroughbred race cars with slick tires. The new GT3 achieves this with comparatively modest power, and is still fully suitable for everyday use. Stop trying to make sense of Preuninger’s statements. It is impossible. Just look at the car, and judge it on its own merits. All signs so far point to this being a legendary car.